Most years in January I run a 21-day gut healing group program (paid). 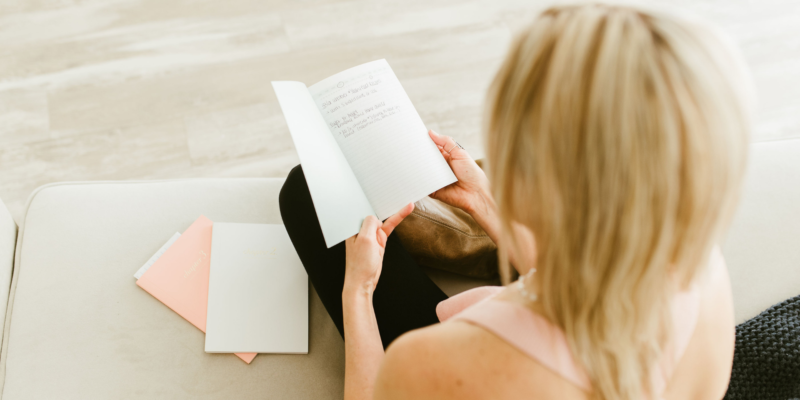 This year, I’m doing a free 21-day gut healing inspiration journey instead. Yes, that’s right. It’s free. Anyone can sign up, and you can sign up now HERE. If you’re not sold yet, then continue reading for more information. 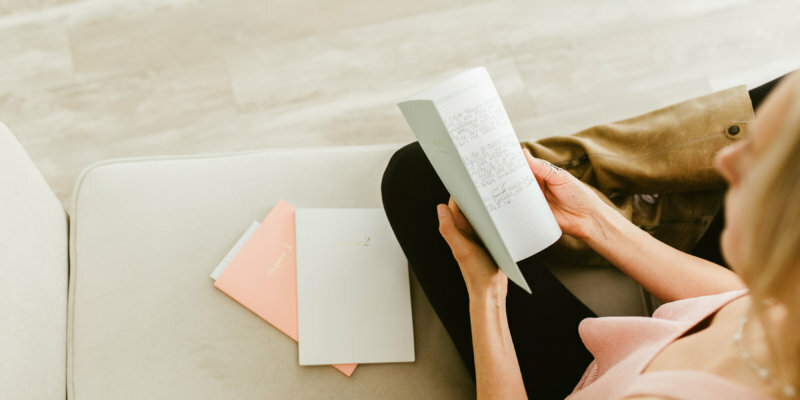 It’s been quite some time since I released The Gutsy Girl’s Bible: an approach to healing the gut, 3.0 (the final version) which is ample time for me to be able to put together The Gutsy Girl’s Bible 3.0 FAQ…..because I am asked questions weekly around the e-book. 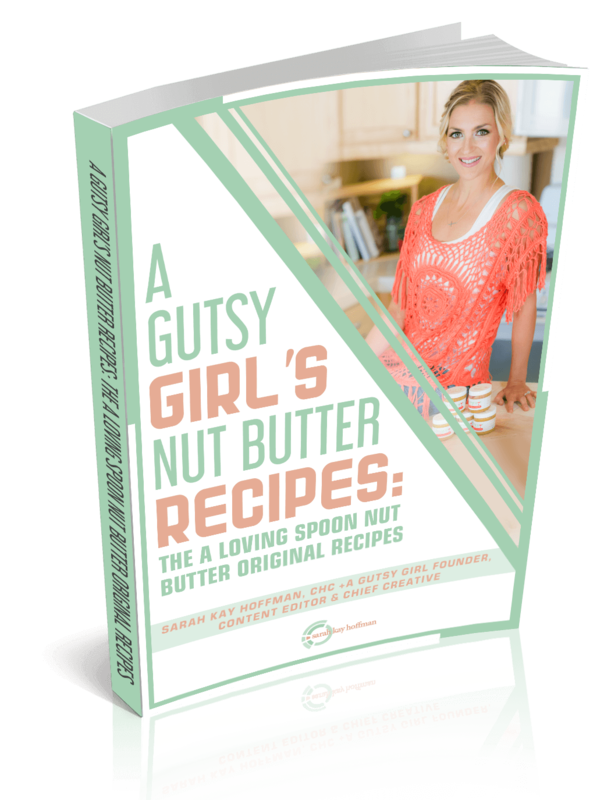 I have received many questions about A Gutsy Girl’s Nut Butter Recipes: The A Loving Spoon nut butter original recipes since I released it, so today I put together my nut butter e-book FAQs. Why did you stop making the nut butters? It seems like such a great niche product. Why did you decide to give the recipes away? In the end, I decided that their best interest was to share them with as many people as possible so that their gifts of bare ingredients, bold flavor, and unprocessed guilt could be enjoyed forever. Why is the e-book $10? 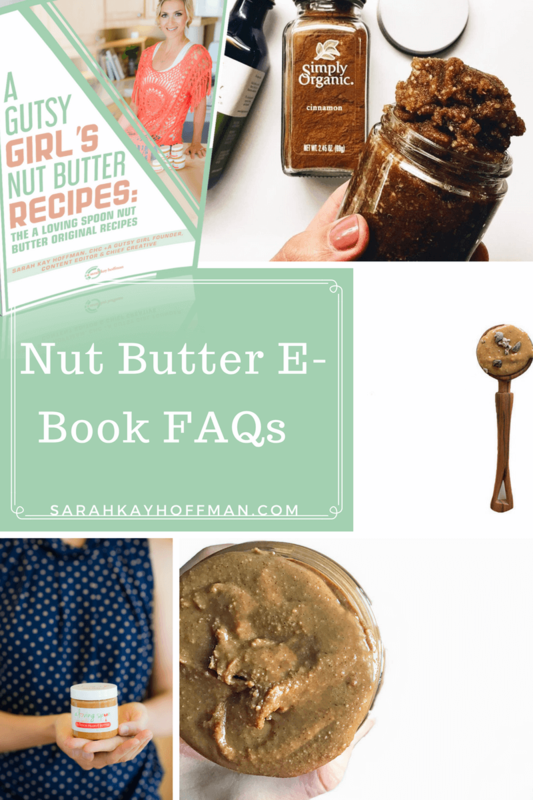 In today’s world where e-books are sold online for much cheaper, $10 might seem like a lot to pay for nut butter recipes. I asked several people their opinion on e-book price point. Some said to go super low for volume, and others said, “Well, I would never give these recipes in the first place because you can’t put a price on them.” I just kind of landed on $10 without much reason, but what I can tell you is that I chose to not go super low because these aren’t just any nut butter recipes. 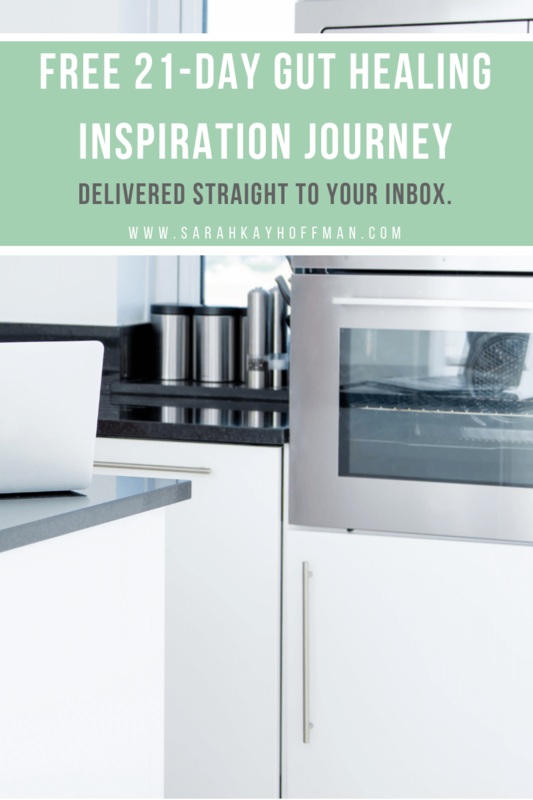 They are the recipes that an entire business was built on, a business that I poured every last ounce of my being into – financially and emotionally. You give said co-packer your recipe. Said co-packer takes ingredients and mixes at their facility; testing and attempting to replicate product as best as possible. 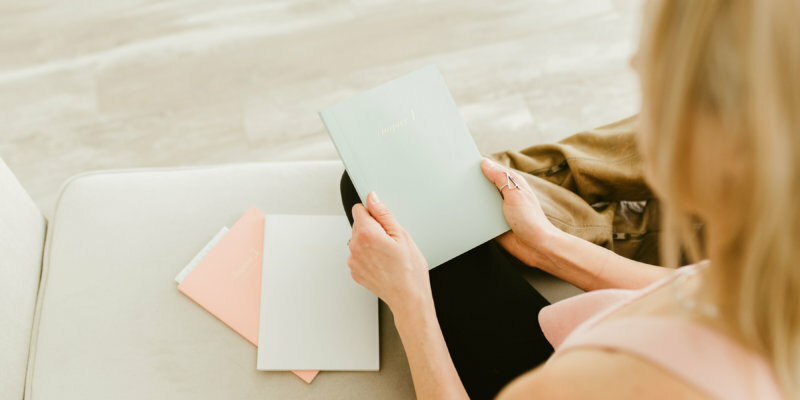 Their version of your product is delivered, with the hopes that it meets your standards so a green light can be given to fully move forward and produce in large quantities. The Honey Vanilla Bourbon Peanut Butter came back to me. I knew with the very first bite that this was not my product. And like other food-tasting challenges, we then had several other people taste the original Honey Vanilla Bourbon Peanut Butter and the new Honey Vanilla Bourbon Peanut Butter. Every single person knew immediately which was not mine, and furthermore, those who had never had the original version knew immediately that they liked that original best. It all comes down to ingredients. Once you make it to a co-packer, they typically use their own ingredients (to cut down on cost), unless you’re really lucky and can send in your own ingredients. They understand that there is xyz in a product, but they don’t use the same xyz as the initial product used. What happens when I pay for the e-book? Once you checkout, you will immediately be sent a link to download the e-book. You can save the PDF on your desktop. You can also download it from you iPad or iPhone, and then open it up in iBooks to have the recipes right next to you as you make them. Did you design the e-book? Um, no! I am not a graphic designer by any means. I used to spend a lot of time putting together my own e-books, but then I realized that was a horrible use of my time and I found a designer to work with who produces all of them now. I simply provide all the material and content and images, and then the design and layout are handed off to him. How many recipes are in the e-book? After I make the nut butters, the oil sometimes separates. Why? That’s the nature of natural nut butters. Go to any store and check out the natural nut butters. You will see oil separation. Just stir (or store the jar upside down). Did you break down the calories, fat, carbs, etc. for each nut butter? No. 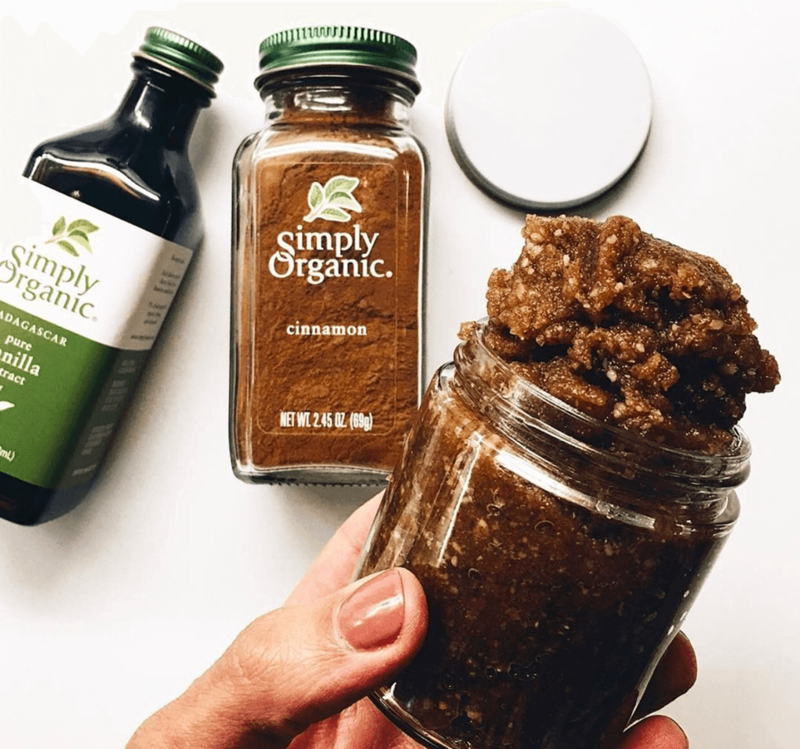 We did all of this for the products that were launched nationwide (the peanut butters), and they all were consistent with 80-ish calories, 7-ish grams of fat, and 3-ish grams of carbs per tablespoon. However, in this house we could ingredients (and quality of those ingredients) vs. macro nutrients. I believe in its power. Can I buy the e-book for someone? Of course! All you have to do is purchase the e-book, and when the link is sent to your Inbox, forward it on. Please only enjoy one copy per household. Once I make the nut butters, what do I do with them? Click HERE to learn 10 Ways to Enjoy Raw Nut Butters. The e-book also contains 44 Simple Nut Butter Pairing Options. On a more literal note, though, you do not need to store these in the fridge. If you enjoy them from the fridge, you can store them there, but in your pantry is perfectly fine. Conservatively, they will last 3 months (but my chemist and co-packer once told me they are fine up to 6 months). I am a part of the Press and/or a Blogger, and I’d like to review a copy. Can you send me one? Possibly. For all Press and Blogger inquiries, please click HERE to contact me. pssst….. @KaleJunkie already reviewed the e-book and made the Carrot Cake Walnut Butter! As I was nibbling on the Java Almond Chip last night, I couldn’t help but think of how grateful I am that I put my whole heart into developing these recipes. There is just nothing else like these, and I am proud of what I created. Most importantly, I am excited to share them with the world! If you have further questions, please feel free to comment below so I can address them and/or click HERE to contact me. And seriously, click HERE to buy your copy immediately!